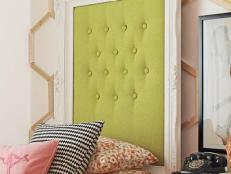 Re-create HGTV Green Home's master bedroom headboard for your own queen-size bed! Twenty-five 12-inch upholstered squares are set in five rows of five to create the unique, eco-friendly design. 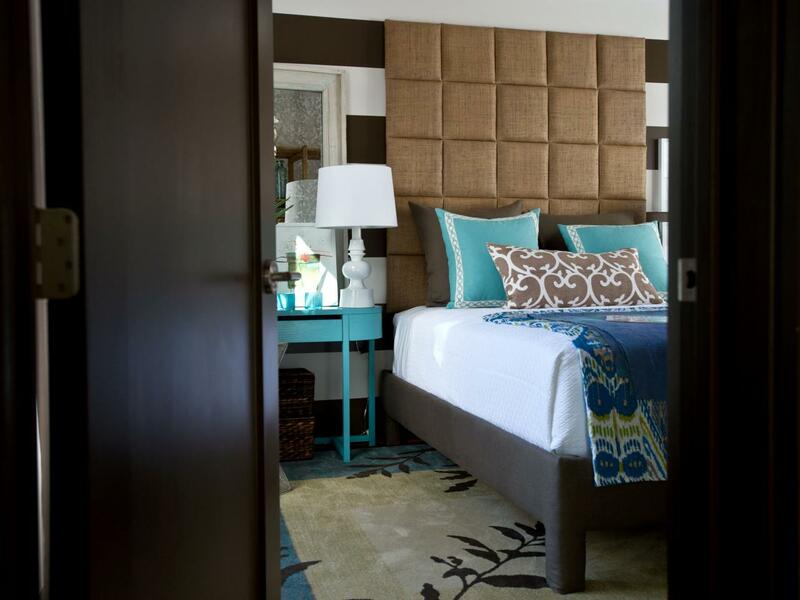 Blue pillows and end table are beautiful accents in this contemporary bedroom filled with browns and tans. A floral rug and throw add a Mediterranean feel. Mark the top of each square with a marker. Lay the fabric face down on a clean flat surface. Using a straightedge, mark 16" x 16" squares on the fabric. (Note: Most fabrics have a "grain." It will be necessary to make a mark on the back of the fabric noting the "top" of each square.) Cut out each square after making the appropriate markings.Mark the top of each square with a marker. Lay the fabric face down on a clean flat surface. Using a straightedge, mark 16" x 16" squares on the fabric. 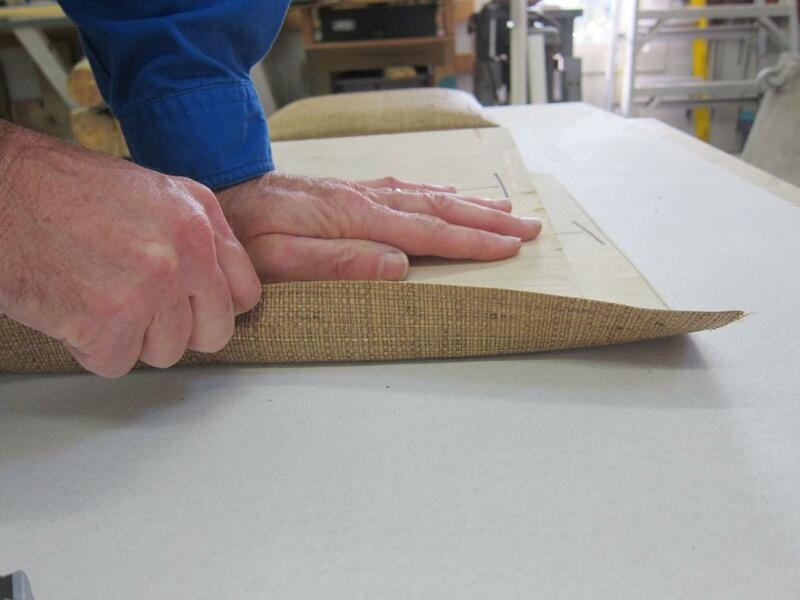 (Note: Most fabrics have a "grain." 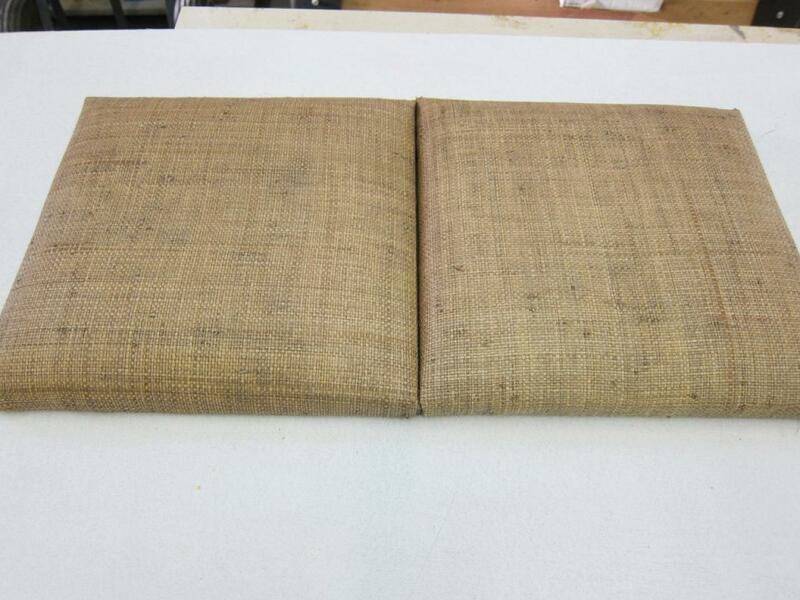 It will be necessary to make a mark on the back of the fabric noting the "top" of each square.) Cut out each square after making the appropriate markings. 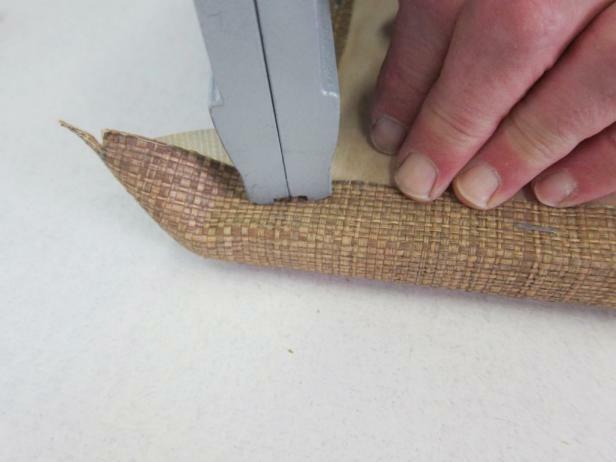 Lay a single fabric square face down. Center the padding on top of the fabric square. Center a plywood square on top of the padding and fabric square. Press one side of the board down, sandwiching the padding between the fabric and the wood. 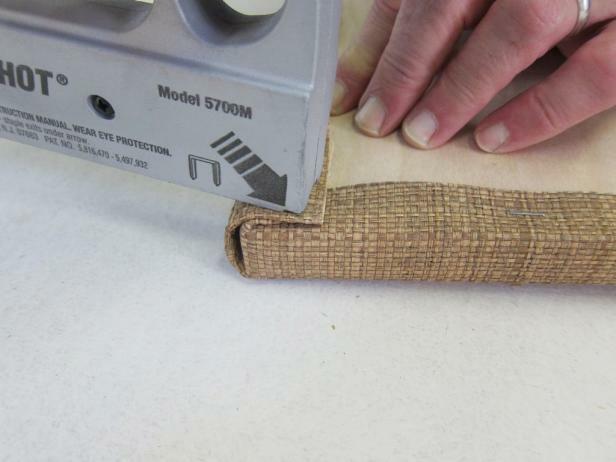 Fold the edge of the fabric over the board. Starting in the center and working out, staple the fabric to the board, leaving 2 inches unstapled on each side of the corners. 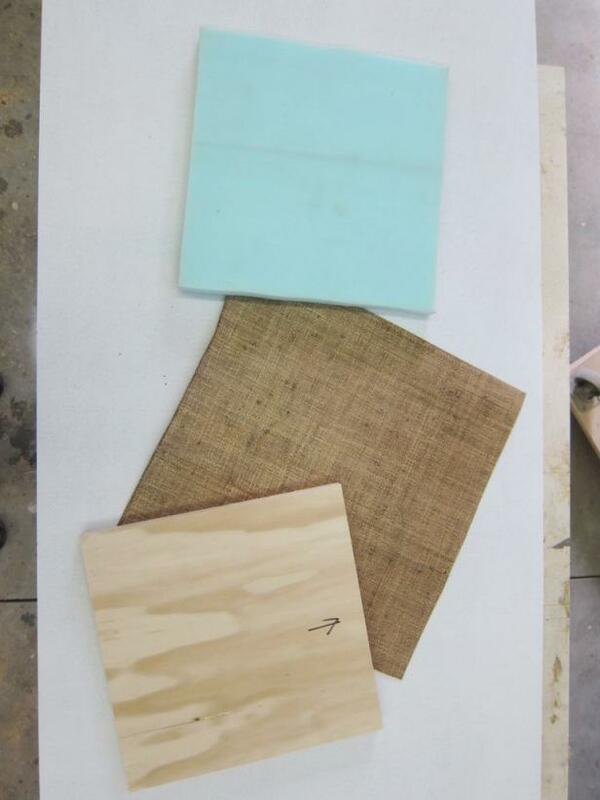 Repeat the above step on the opposite and then the two remaining sides of the board. After stapling all four sides, staple fabric on the right side of each corner to the corner's point. 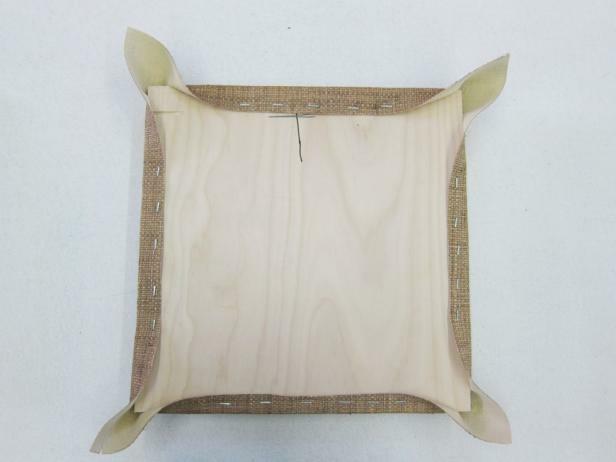 Fold the fabric on the left side of each corner in, pulling the point of the fabric toward the center of the board while folding the edge of the fabric over the board (similar to a hospital corner used in making a bed). Staple the completed corner, ensuring that the staples are close together. 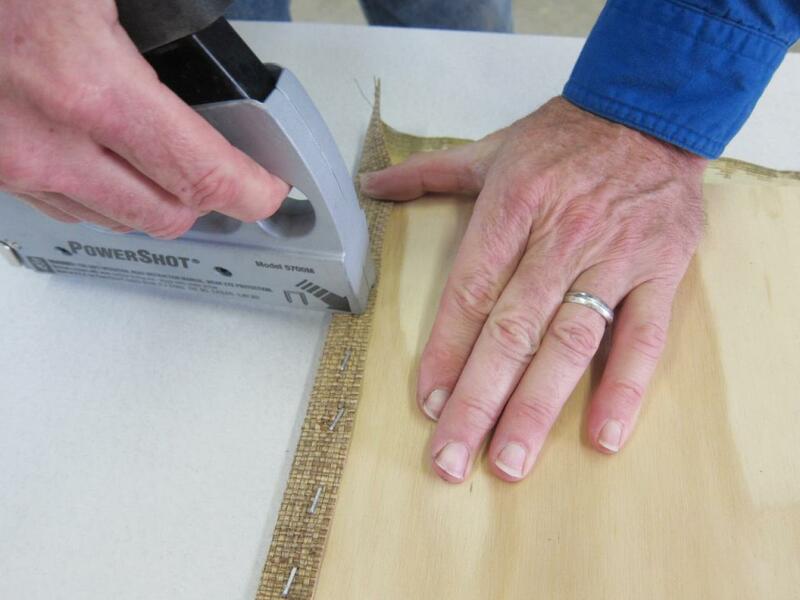 Repeat the folding and stapling process at each corner. Cover the remaining 24 squares, remembering to mark the top of each square on the back. Lay out five upholstered squares, face down, edge to edge. Below the first row, lay out a second row of five upholstered squares, face down, edge to edge. Be sure squares are properly aligned and no gaps exist between rows. 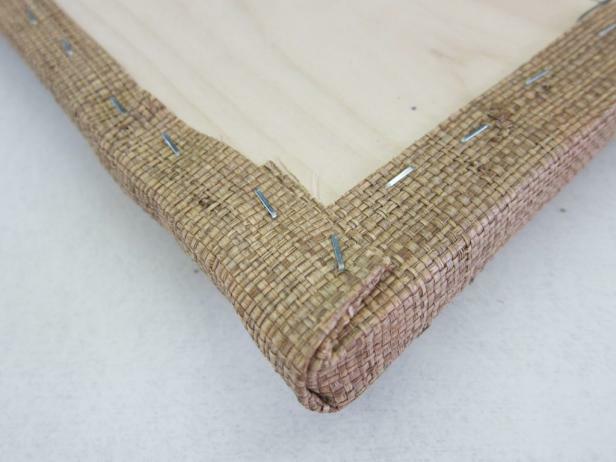 Place a 1" x 4" board on top of the "seam" between the two headboard segments. Center the board so you have approximately 3 inches on each edge of the board. Using the power drill with the 1/8" drill bit, place pilot holes in the 1" x 4" board. These pilot holes (one per square) will be positioned about 1 inch from the edge of each square and centered along that edge. 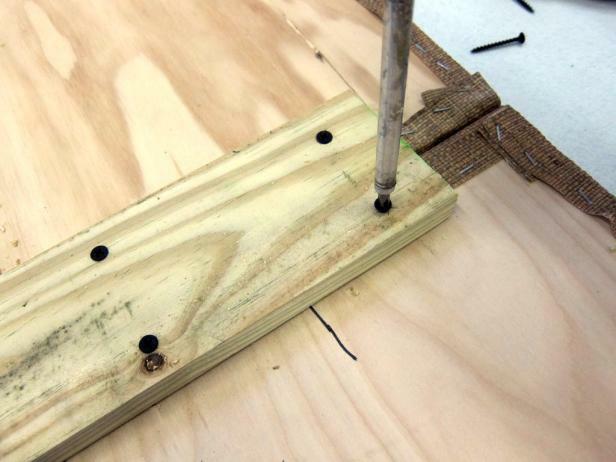 Using the power drill and the Phillips head bit, screw a 1-5/8" screw into each pilot hole along the top row of squares, ensuring that the squares are pushed tightly together. (This step is more easily executed with two people.) 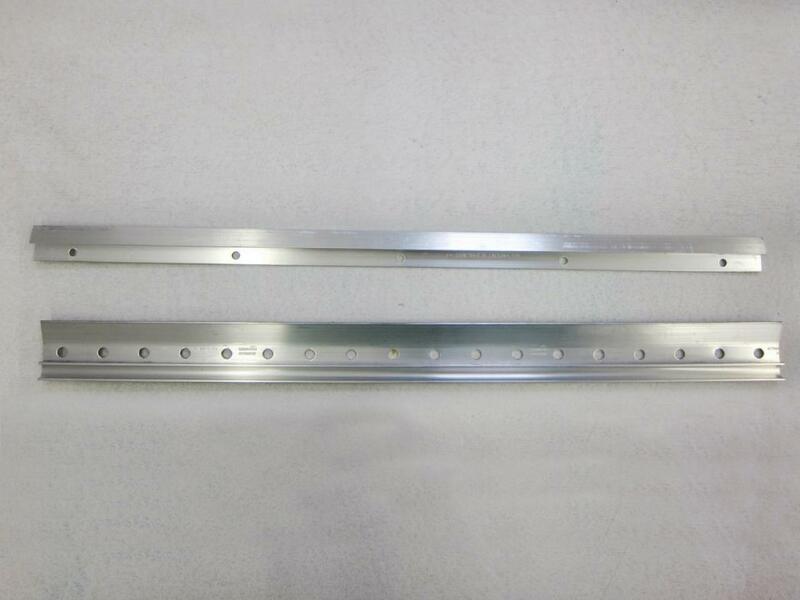 Repeat the above process with the second row of pilot holes, ensuring that this row is snug. Check to ensure that the two rows line up correctly. Note: Do not overtighten the screws, as this may cause the headboard to "bow" as each row is affixed. 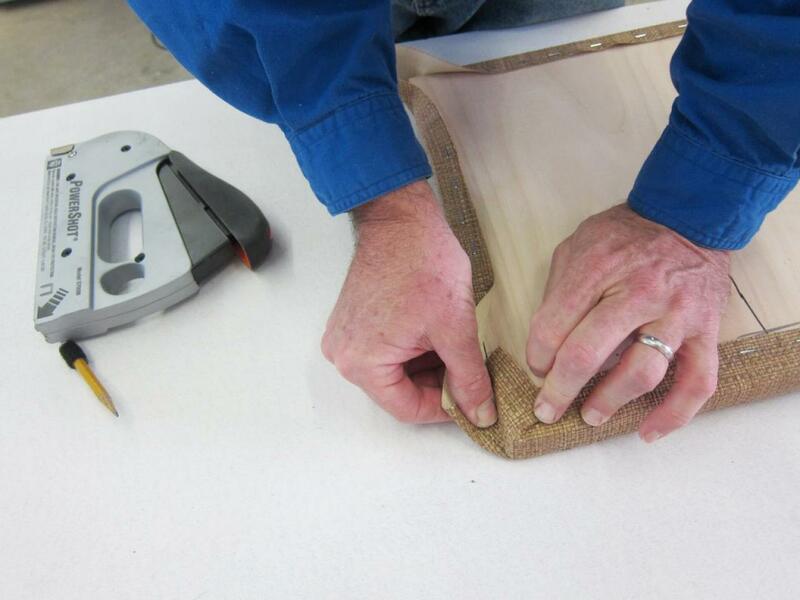 If bowing occurs, loosen screws slightly. Repeat the above process for the remaining rows of upholstered squares. 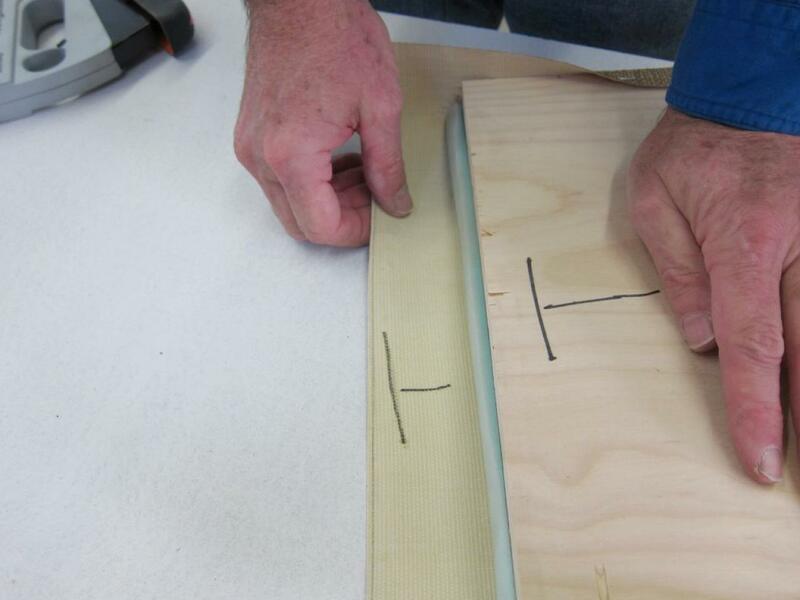 Following the instructions on the French cleat packaging, center and mount one bracket of the cleat to the 1" x 4" board at the top of the headboard. (This board connects the top row of squares to the second row of squares on the headboard.) 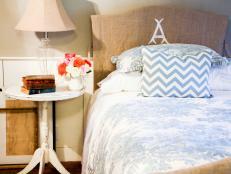 Measure the distance from the bottom of the headboard to the cleat on the back of the headboard. 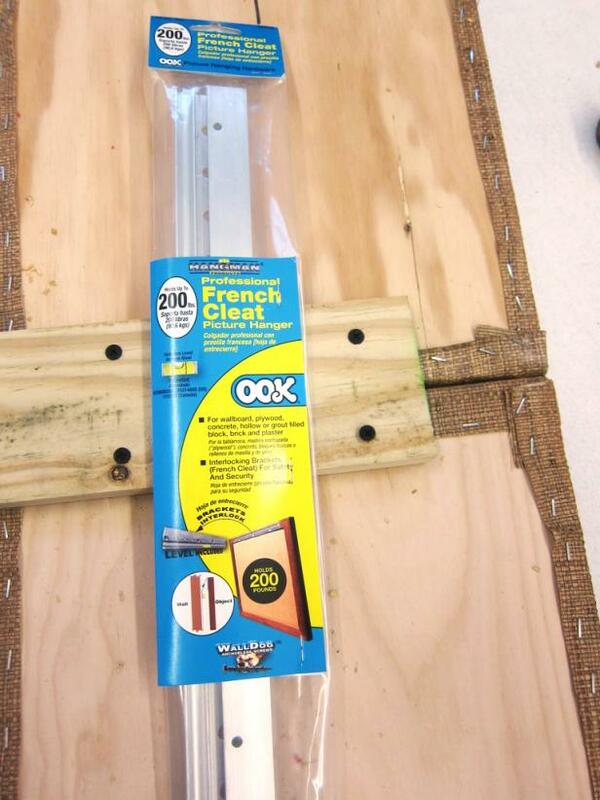 (In our example, the measurement is approximately 4 feet.) Note this distance. 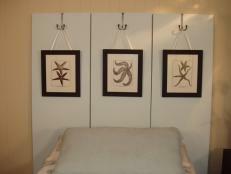 Measuring from the surface of the mattress, make a light pencil mark on the wall approximately 4 feet above the mattress. This pencil mark designates the height of the second bracket of the French cleat. Center and mount the second bracket at the pencil mark. 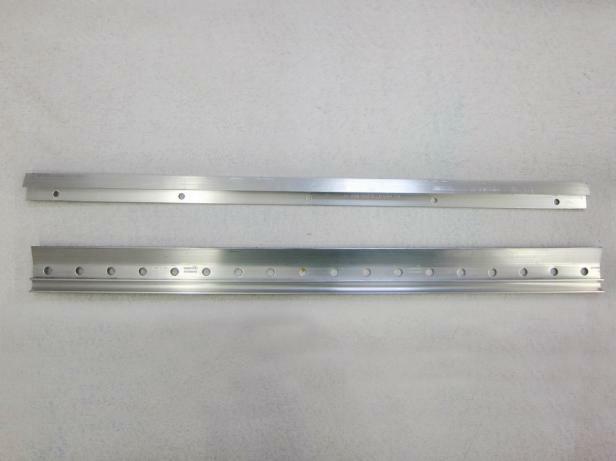 Many French cleats include a level that fits into a groove on the brackets. 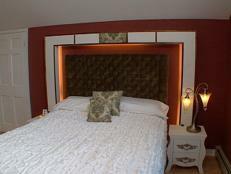 Using the enclosed level ensures that the brackets and, consequently, the headboard are mounted correctly. In the event that a level is not included, a standard level may be used. 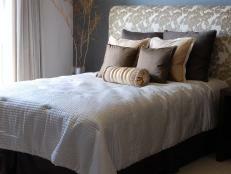 Check to ensure that the headboard is aligned and level. If modifications are needed, adjust the cleat on the back of the headboard rather than the cleat on the wall to correct any issues. 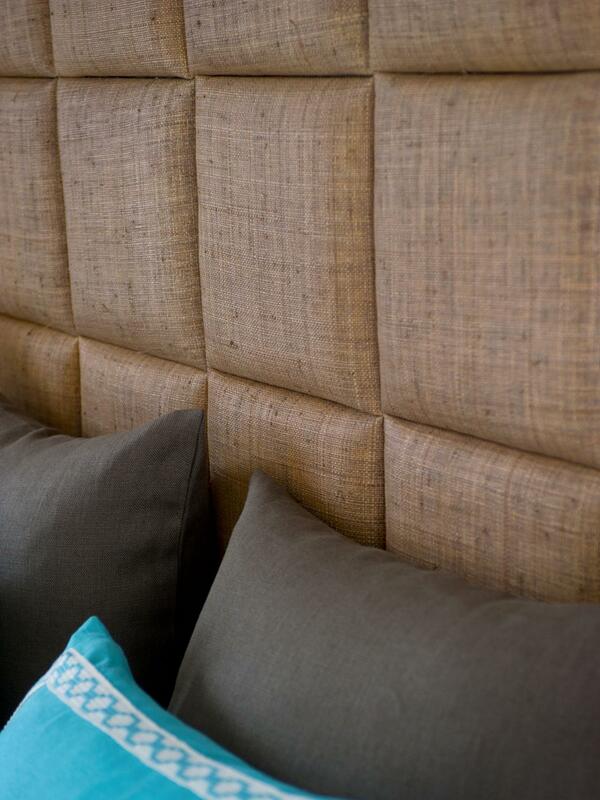 Add instant charm and personality to your bedroom with a wooden headboard. 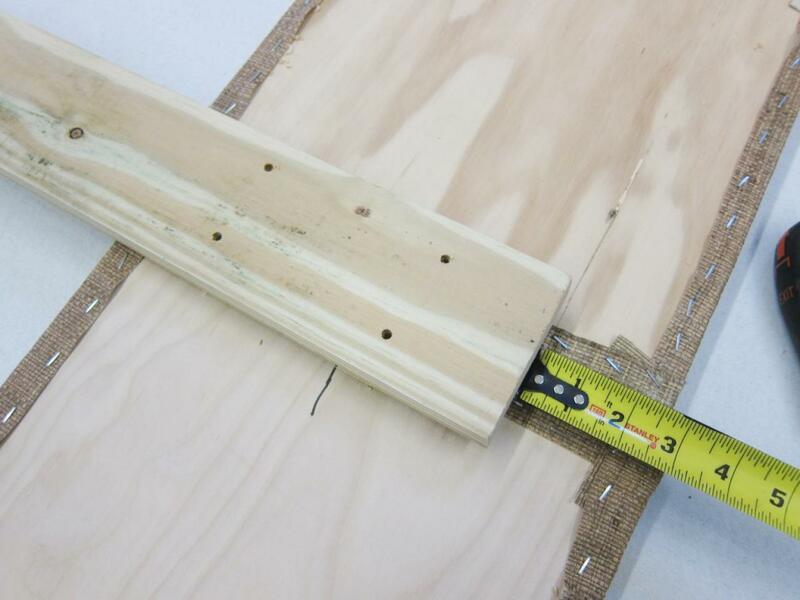 It takes less than a weekend to build and less than $100 in materials. 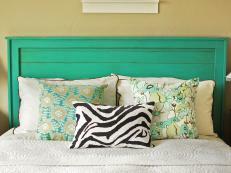 Add style, color and texture to your bedroom with this do-it-yourself headboard that looks anything but DIY. 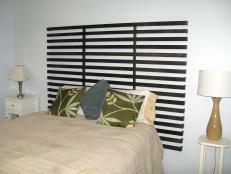 A great project for newbie woodworkers, this headboard can be completed in just a few hours and for less than $100. 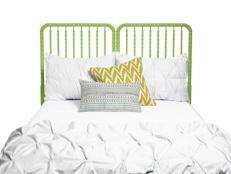 Get ideas on how to create your own headboard from Design Star finalist Alice Fakier. 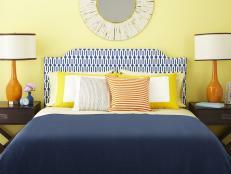 An idea about updating your headboard from Alice Fakier of HGTV Design Star. 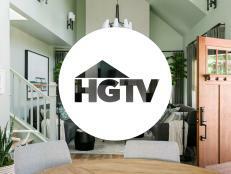 Learn about the design and build team responsible for HGTV Smart Home 2019. Enter daily on for your chance to win $10,000, now through 8:59 am ET on May 15, 2019.